The complexity of drug reconstitution has for many decades constrained the market potential for lyophilized drugs and vaccines. With multiple pieces of equipment and around a dozen non-intuitive steps required to reconstitute a lyophilized drug from a vial, the overwhelming majority of these products are restricted to administration within healthcare facilities. However, the healthcare shift toward patient self-injection and the accelerating momentum behind biologics has sparked a new wave of innovation for drug reconstitution technology. Dual-chamber syringes in particular represent an enabling technology not only for the self-injection of lyophilized drugs, but also other emerging therapies requiring the mixing of two liquid molecules at the time of delivery. More than 300 approved drugs and vaccines requiring reconstitution or mixing are currently marketed for use within the US. By some estimates, between one-quarter and one-third of all FDA approvals in recent years have been for parenteral drugs supplied in a lyophilized format. For some of these drugs and vaccines, lyophilization represents the fastest route to market, with pharmaceutical companies later planning their introduction in an alternative format as part of lifecycle management strategies. The supply of many biologics in a liquid form is impractical or impossible. Instability of liquid stable drugs at room temperature can require costly transportation and storage using refrigeration during the entire life of the product. Pharmaceutical companies may also have concerns that the pharmacokinetic and pharmacodynamic properties of certain biologics in a liquid stable format may diminish over time. For such biologics and other drugs or vaccines, their supply in a lyophilized or powder form requiring reconstitution at the point of delivery can represent the only feasible pathway to commercial launch. The majority of lyophilized drugs and vaccines are targeted for administration via IV infusion, intramuscular, or subcutaneous injection. The traditional process for their reconstitution requires up to a dozen steps incorporating a syringe, a single- or multi-dose vial with the drug, a second vial or syringe with diluent, one blunt needle, and one narrow bore needle for injection. Vial access devices, vial adaptors, and vial-to-vial systems are also becoming common for use with some reconstitution therapies. Given the paramount importance of avoiding errors during the reconstitution of an accurate dose, the self-injection of such therapies has long been recognized as being unfeasible without a device that is extremely intuitive for the user. 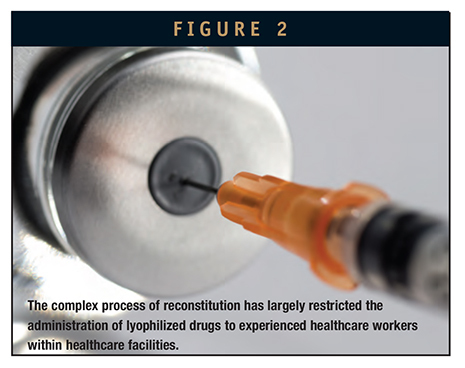 The relative complexity of conventional reconstitution systems compared to other device categories used with liquid stable drugs has therefore largely restricted lyophilized drugs to injection by healthcare workers within the confines of hospitals and other secondary care sites. Even with extensive staff training, the process of reconstituting lyophilized products within healthcare facilities can involve some significant challenges. Inefficiencies include the need for facilities to purchase and stockpile multiple pieces of inventory and the lengthy preparation time required to reconstitute a therapy with the correct dose volume prior to injection. For mass vaccination programs in which an operator may be delivering dozens or even hundreds of injections per day, the length of time required to reconstitute a dose can become particularly cumbersome. With the FDA placing an increasing focus on human factors in the approval of new drugs or formulations, pharmaceutical companies risk failure if data cannot be presented that demonstrates sufficient levels of reliability and dose accuracy during the reconstitution and injection process. 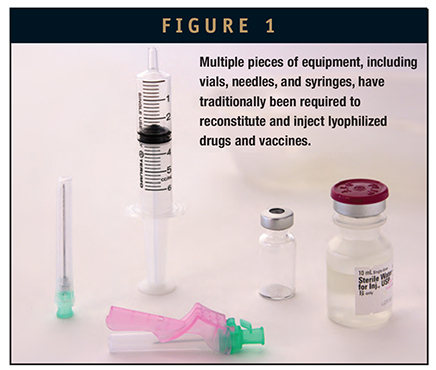 The traditional process of reconstituting a lyophilized drug may also exacerbate the risk of needlestick injury for a healthcare worker, as syringes with attachable needles are typically used to draw a reconstituted dose from a vial. To comply with needlestick prevention laws in within the US, Europe, and other international regions, healthcare workers will typically attach safety needles with needlestick prevention systems, such as a sliding sheath or hinged arm. Filter needles used for vial access lack safety features altogether. For fine needles used for injection, these ancillary safety products require post-removal activation of the safety mechanism, with the operators required to undertake a second manual action, such as placing their hands close to the needle after completion of injection. An estimated two-thirds of all reported needlestick injuries involving safety products are caused by such manually activated products. Organizations, such as the Emergency Care Research Institute, also site a common practice amongst many healthcare workers to not activate the safety mechanism of such manual products, creating the risk of downstream injury, unsafe disposal, or syringe reuse. For IV applications, there are many therapeutic drugs in which there are no suitable or sub-optimal system to seamlessly integrate reconstitution, dilution, and delivery. A shortage of easy-to-use drug reconstitution delivery systems has constrained market opportunities for the self-administration of many approved therapies by patients outside of healthcare facilities. In some cases, the lack of an effective reconstitution system has prevented the commercialization of promising injectable therapies in which a business case can only be made for patient self-injection. Despite conventional reconstitution technologies being unable to fully address many of these unmet market needs, some pharmaceutical companies have sought to make their injectable therapies available for patient self-injection to address significant healthcare challenges. One example of a lyophilized drug currently supplied in injection kits for reconstitution and use outside of healthcare facilities is glucagon. A selection of glucagon therapies are available by several manufacturers that that are targeted for use by the family members or other caregivers of patients requiring emerging treatment for severe hypoglycemia. With current glucagon therapies beginning to fibrilize and become unstable shortly after entering into a liquid form, the only available option is to keep the drug in a lyophilized form where it can be kept on hand and stored at room temperate for up to 2 years. Supplied in emergency kits in a lyophilized vial and a syringe filled with diluent, such glucagon products must be rapidly reconstituted and injected by a caregiver who may have little to no prior experience or training. With the risk of brain damage or death increasing the longer a patient experiences severe hypoglycemia, the rapid, intuitive reconstitution and delivery of the drug is critical. To administer glucagon with this kit, the liquid solution must first be injected into the vial with the dry powder and mixed. After the glucagon powder has dissolved, it is then drawn back into the syringe, a needle attached, and the glucagon injected into the patient. In order to properly administer the glucagon dose, a caregiver must follow a multi-step process in a situation typically made even more challenging by the patient’s condition. The complexity of currently available rescue kits and the training required for proper administration of glucagon has resulted in the underuse of glucagon as a rescue treatment for diabetes patients experiencing severe hypoglycemia. Indeed, only 10% to 20% of high-risk patients who should by diabetes education standards have an unexpired glucagon kit actually having one. Furthermore, many ambulances fail to carry glucagon emergency kits for reasons including their provision in devices that lack adequate needlestick protection. Pharmaceutical companies have long recognized the potential of dual or multi-chamber prefilled syringes to enhance the portability, efficient reconstitution, and intuitive delivery of lyophilized or powder-filled drugs by healthcare workers or self-injecting patients. For the pharmaceutical manufacturer, the delivery of such therapies in a single device can help to minimize transport, packaging, and shipping costs compared to relatively bulky injection kits. More importantly, it creates opportunities to differentiate a drug product against rivals within a competitive therapeutic class. Compared to the traditional process of reconstituting a dry drug from a vial, a dual-chamber prefilled syringe can potentially reduce the number of steps by half or more. Such efficiencies created by dual-chamber syringes can reduce the length of time required to reconstitute and inject a dose, as well as helping to minimize the risk of dosing errors. Combined with improved portability, these benefits may enable a therapy previously approved only for administration by a trained healthcare worker to in the future be supplied for convenient patient self-injection. Particularly in cases where improved levels of therapy compliance can be demonstrated, these benefits can be leveraged by a pharmaceutical company to generate strong preference for their brand amongst patients, payors, and prescribers to drive market share and maximize revenues. To date, however, only a handful of products have been launched with a dual-chamber syringe. Furthermore, only a handful of dual-chamber syringe technologies are marketed by device manufacturers. Technological limitations and human factors associated with traditional dual-chamber syringes may have contributed to poor levels of acceptance by pharmaceutical companies in the past decade. Some dual-chamber technologies can require the user to break sterility before reconstitution by replacing the rigid needle seal used for packaging with another special vented cap used for reconstitution. For healthcare facilities that prefer to reconstitute multiple doses at the start of a shift and then keep them refrigerated until injection, the compromising of sterility can represent a significant challenge. Some dual-chamber systems also require the user to hold the device at a specific upward-facing orientation, otherwise, leakage of the drug or device failure may occur. Safety features are also not integrated within any traditional dual-chamber system technologies, restricting their capacity to protect those at risk of needlestick injury. The inability of conventional drug reconstitution delivery systems to address these unmet and other emerging market needs has constrained this market sector to low levels of market growth compared to other device sectors, such as prefilled syringes, autoinjectors, and wearable injectors (patch pumps). However, recent advances in drug reconstitution technology now herald the arrival of a new era in the intuitive reconstitution and delivery of lyophilized therapies by healthcare workers or patients. When combined with growing pharmaceutical investment in the development of liquid-liquid combination products, the market for dual- or multi-chamber syringes is poised to enter a period of rapid growth and expansion throughout the coming decade. Unilife is one company addressing these and other emerging needs for the mixing or reconstitution of lyophilized drugs and vaccines. The US-based emerging leader for injectable drug delivery systems has developed a broad array of technologies under its EZMix mixing platform that represent a compelling proposition to enhance and differentiate biologics, drugs, and vaccines requiring reconstitution or mixing at the point of delivery. • USP-Compliant Materials: EZMix syringes can securely house a dry or liquid drug in one chamber, and a measured dose of a diluent or liquid drug in another chamber. • Standard Fill-Finish: Supplied as per standard handling practices for integration with standard filling and packaging processes and equipment. • Flexible Dosing: A wide range of viscosities, dose volumes, and administration routes can be accommodated. • Minimal Steps: Compared with traditional reconstitution systems and other marketed dual-chamber prefilled syringes, EZMix requires only a few intuitive steps for reconstitution and safe delivery of the dose. • Ventless, Orientation-Free Mixing: Unlike some systems requiring the device to be held at specific orientations and to break sterility before reconstitution forcing immediate injection, EZMix can be held at any angle and remains sterile until injection to minimize the risk of drug wastage. • Clear View of Dose: Users have an unobstructed view of the drug at all times. • End-of-Dose Indicators: Audible, tactile, and visual indicators confirm end-of- dose delivery and the automatic activation of the needle-retraction mechanism. • Automatic Retraction: Needle retraction is activated automatically, with the user able to control the speed of withdrawal directly from the body into the barrel to minimize the risk of infection from needlestick injuries or blood splatter. • Convenient Disposal: The needle is automatically locked inside the syringe barrel after retraction to enable compact, convenient disposal. The EZMix mixing platform is fully customizable to address specific customer, therapy, and patient requirements. Customization options include drug and diluent volumes, the use of staked or attachable needles, silicone minimization, extendable flanges, and coated elastomers. One recent customization program recently announced by Unilife addresses the aforementioned market need for the intuitive reconstitution and injection of glucagon under emergency situations. The customized EZMix syringe developed for a customer allows a caregiver to automatically reconstitute and deliver the dose down in two simple steps that can be summarized as twist and inject. As a ready-to-mix product with minimal steps and automatic safety that is ideal for use by either healthcare workers or self-injecting patients, EZMix products are perfectly positioned to generate powerful brand differentiation for injectable therapies targeted for use in competitive markets. Even when compared to other dual-chamber options, EZMix features a sleek, elegant, and attractive design with no unsightly springs or mechanisms. Being highly compact in size, it is visually attractive before, during, and after use. Combined with superior human factors, including ventless, orientation-free, and error-free steps of use, EZMix represents a compelling choice to build preference rates and differentiate a lyophilized or combination therapy from the competition. Whereas dual- or multi-chamber syringes are poised to redefine the market for lyophilized or combination therapies targeted for hand-held subcutaneous or intramuscular injection, advanced drug reconstitution technologies also have significant potential in other related market areas. Some pharmaceutical companies are seeking to reconstitute or mix liquid or dry drug combination therapies in dose volumes that are greater than 1 mL. For such therapies, targeted for subcutaneous administration by patients, wearable injectors incorporating drug reconstitution technology represent an exciting commercial prospect. For other therapies that will be administered via IV infusion via syringe pumps in dose volumes of between 3 mL and 30 mL, new technologies have the potential to significantly reduce the number of steps and enable reconstitution and dilution at the point of delivery. With dual-chamber syringes and other emerging device technologies now addressing key market requirements for intuitive reconstitution and injection, the pharmaceutical market for therapies suitable for reconstitution and mixing at the point of delivery is poised for significant rates of growth. Companies such as Unilife are ready to support pharmaceutical companies in the clinical development and lifecycle management of these drugs to help enhance the provision of care across the healthcare spectrum. Mr. Alan Shortall is the Founder, CEO, and Executive Director of Unilife Corporation, a US-based developer and commercial supplier of injectable drug delivery systems. Established in 2002, it builds long-term collaborations with pharmaceutical and biotechnology companies seeking to utilize its innovative and highly differentiated devices to enable or enhance the clinical development, regulatory approval, and lifecycle management of their injectable therapies. Mr. Shortall has guided the development by Unilife of one of the most expansive and market-driven portfolios of primary drug containers and advanced delivery systems available for the administration of injectable therapies. Device platforms include prefilled syringes with integratedneedle retraction, auto-injectors, drug reconstitution delivery systems, bolus wearable injectors, and other specialized delivery systems. For more information, visit www.unilife.com.